These days, homeowners have plenty of ceiling types to choose from to customize their homes and improve the overall decor of their spaces. Exposed Beams Ceilings – For homeowners who prefer a more rustic look and feel to their interior, exposed beam ceilings are becoming increasingly popular. Many homeowners are opting to leave their beams and pipes exposed rather than covering their ceilings. This gives the look of a more lofty, open feel in addition to providing some unique character. 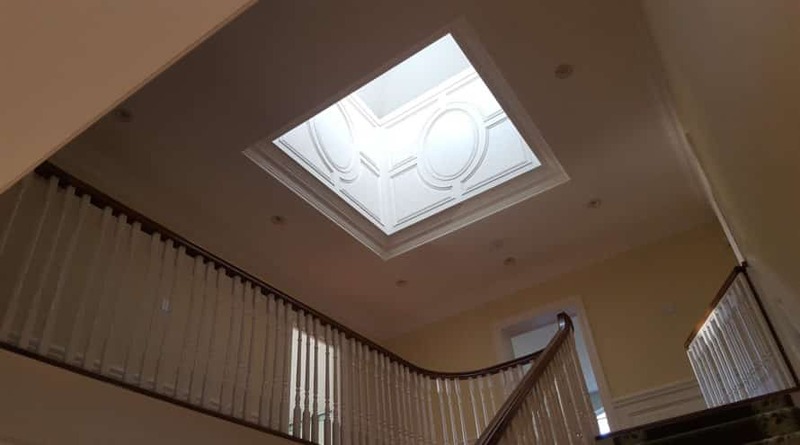 Tray Ceiling Styles – These types of ceilings are characterized by a unique cut-out design whereby the middle part of the ceiling is recessed. Light fixtures are usually mounted into the deepest parts of the ceiling surface. The ceiling can be painted all one colour, or the inner part may be painted in a different shade to add some depth and definition. Vaulted Ceiling Styles – This ceiling type has sloped surfaces, often angled with the roof shape. Vaulted ceilings may also be characterized by slopes of equal length and angles that meet in the middle, whereby other vaulted ceilings may feature uneven slopes. 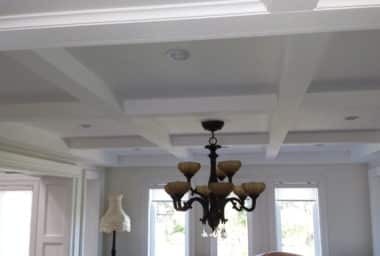 Coffered Ceiling Styles – This sophisticated type of ceiling features sunken square or rectangular-shaped panels that are repeated in a pattern across the entire ceiling surface. Light fixtures or ceiling fans are often hung from the center panel with pot lights scattered on all others. Domed Ceiling Styles – Larger-scale homes are better able to accommodate domed ceilings, which are similar to those that are featured in old churches. These domed ceilings are often characterized by murals, skylights, or even stained glass. Smooth Finish Ceilings – For homeowners who are looking for something more simple yet still sophisticated, smooth-finish ceilings make the ideal surface. They’re easy to clean and still provide a stylish ceiling for a home’s interior. What if You Have Popcorn Ceilings in Your Home? Any of the above ceiling finishes and types would make great additions to a home. However, if your home is currently plagued with ugly popcorn ceilings, you may want to have them removed before installing any one of the aforementioned ceiling types. 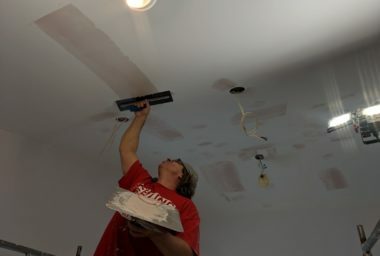 Before you go ahead and remove that popcorn ceiling, you may want to consider having the professionals in this business do it for you. This is a tough job that requires a lot of elbow grease and time. Without the right tools and experience, you could be left with a bigger mess than you started out with. At the Ceiling Specialists, we’re heavily experienced in the removal of popcorn ceilings and the application of more modern finishes. 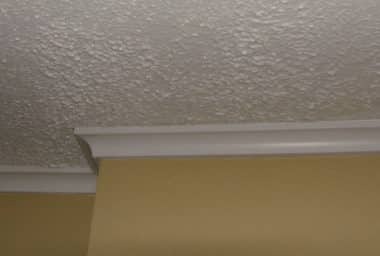 Give us a call today to have your popcorn ceiling replaced with beautiful smooth ones!